COOLVILLE/TUPPERS PLAINS — The Vanderhoof Jolly Workers celebrated their 70th year anniversary on Nov. 3, 2018, at the Lottridge Community Center with an afternoon of good food catered by Nives Knisley; great entertainment by Lisa Queen and her band; and fellowship and laughter sharing special memories from past and present members. 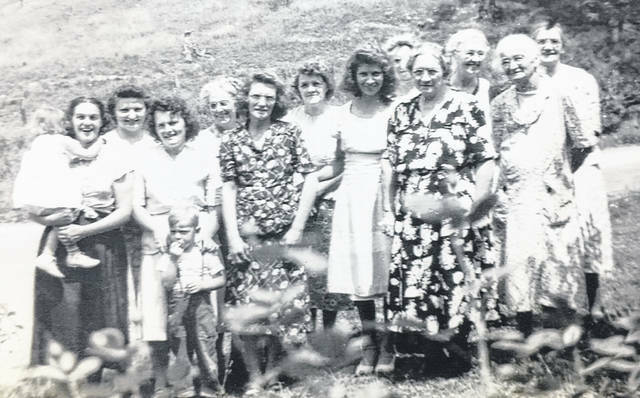 The Vanderhoof Jolly Workers was organized in November 1948 when eight ladies (Alta Bailey, Armour Brummage Bailey, Margarite Burdette, Mabel Butcher, Ruth Knapp, Nellie Moore, Pauline Price and Naomi Williams) met at the home of Nellie Moore and formed the club. Now, 70 years later and still going strong, the Vanderhoof Jolly Workers currently has 21 active members. During the past years, the club has gone through many changes. 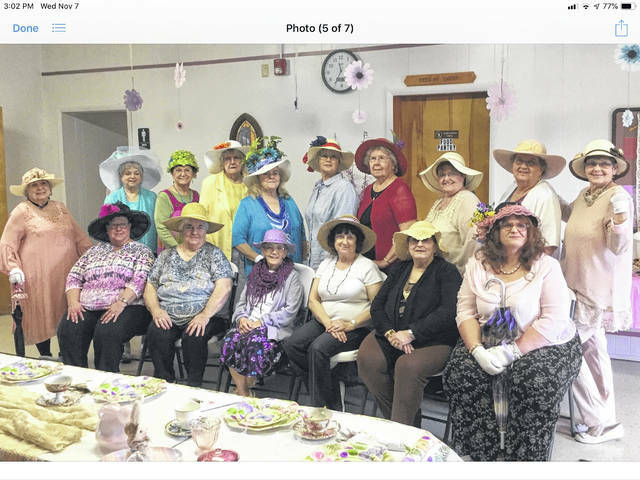 The group was originally formed as a homemakers’ club, and its purpose was to help one another with all types of chores that women of that time faced. That included canning, wall papering, mending clothing, quilting, cleaning houses and helping to feed the men who were farming. In a short time, the group began reaching out to help non-members in the community who were in need. Today, the club continues to support special needs of families, schools, libraries, children in the community, and others in surrounding areas that they hear are in need of their support. Their goal is simply to help people they feel need their support both financially and emotionally. Money-making projects for the club treasury have included many things. During three different years — 1976, 1982 and 1999 — recipes were gathered and cookbooks were published and sold. Members have run concession stands at auctions; held yard sales; sold items at craft bazaars; had a Chinese Auction with a pasta dinner; sold Stanley products, Rada Cutlery, Sarah Coventry Jewelry and Rubbermaid products; and held White Elephant Sales and Purse Auctions. With funds from the treasury and time donated by members, the Vanderhoof Jolly Workers have done many philanthropic things. The group’s giving has included and still includes things like providing funds for prescription medicine costs, paying on funeral expenses, giving gas and food certificates to families who have members hospitalized, paying registration fees to Diabetes Camp for a young lady, giving funds to attend a Special Camp, contributing annually to the summer reading and feeding program at the local library, annually providing hand sanitizer bottles to a school, purchasing clothing and other needs of people who have been burned out of their homes, giving donations to chemo patients for travel to treatments, providing meals for the elderly in need, making Adult Lap Protectors for nursing home residents, and sending care packages to soldiers. Their works have also included giving financial support to programs including Coolville Elementary, Federal Hocking Middle School, Little Hocking Elementary, Eastern Elementary, the Beacon School, the Children’s Home, the Chillicothe Veterans’ Home, the Heart Fund, the Cancer Society and the Cancer Bike Hike, St Jude’s Ranch for Children, Special Olympics, the Diabetic Walk for a Cure, My Sisters Place, the Old Man River Project, Amazing Grace Community Church, the Good Works Mission Project, and the Women’s Care Center. In January of 1949, the idea of having “Secret Sisters” became of interest and is still a part of the club today. Becoming a Secret Sister gives someone the opportunity to bring a smile to someone’s face, to form friendships and to encourage others. The purpose is not the gifts. Gift giving and receiving is not only fun, but also rewarding. The love behind the gift is the most rewarding. Members also started exchanging gifts for birthdays, anniversaries and Christmas. In 1967, the budget for those gifts was $2 for birthdays and anniversaries and $5 for Christmas. The amount has slowly increased, and around 2000, it increased to $5/$10 for birthdays and $15 for Christmas. Meetings have always been held on the 3rd Wednesday of each month, except for November and December when it is on the 2nd Wednesday of the month because of being too close to Thanksgiving and Christmas. Originally, the meetings rotated from home to home with a potluck dinner. A few years back the ladies decided to hold monthly meetings at the Amazing Grace Community Church in Tuppers Plains, where there is plenty of room for the potluck and for conducting meetings. In 1948, club dues were .10 cents per month. In 1990, they increased to $2.50 per year. In 1997, they increased again to $5 per year. Presently, annual dues are $12. In 1955, the club song was “Brighten the Corner Where You Are”. There is no record to explain why it was changed in 1965 to “The More We Get Together”. The club has had 118 members who could be accounted for from 1976 until present time. No records are available for the years 1948 to 1976. Many of these members were with the group for only a few months; others for years. The longest membership at present time is Betty Green with 51 years. At present, there are 21 active members on the roll. Members hope to keep the Vanderhoof Jolly Workers going strong as they work to fulfill their mission to committing to acts of kindness and charity as needed in their community and to their community members for years to come. Submitted by Cindy Chadwell, president.